You can deny Lara the use of her weapons by the use of a new flipeffect. Any weapon Lara is holding when the flipeffect is triggered will be removed from her hand(s) (or in the case of the shotgun from her shoulder) and any holstered weapons will be removed from the holsters. All weapons will remain in the inventory. Once re-enabled by using another flipeffect, they cannot be used until they have been selected from the inventory. Also the Pistols & Uzies will only reappear in the holsters after being selected from the inventory. 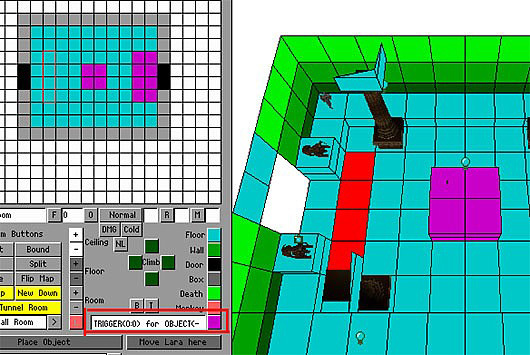 To setup the flipeffect click on the floor tile or area of floor where you want the effect to be triggered and click inside the text window next to the pink trigger button shown in the screenshot below. This will bring up the set trigger type window seen here. Using the dropdown boxes select these trigger parameters. Click the ok button to close the window, and finally click the pink trigger button. To re-enable Lara's weapons carry out the same steps as above but set the trigger parameters as shown here.